Good, better, best. Never let it rest. Until your good is better, and your better is best. 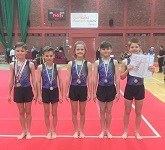 Grays Gymnastics Club provide classes in numerous settings across Conwy and Denbighshire for boys and girls of all ages and abilities.